Buzz Off has seen a 40% growth in the LLIN nets it distributed in 2012 – last year we distributed 14,350 LLIN nets into remote areas of Burma, Papua New Guinea and western Papua. 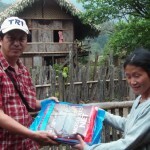 The previous year we saw less that 10,000 nets distributed. Each LLIN net saves the lives of up to 5 people for 4 years. In village situations it not unusual for a whole family to sleep under a family sized net. We cost each net at $10 per net this figure includes the price of the net plus freight. Where we are able to buy nets for less we use the funds to buy more nets. In 2013 we plan to distribute 20,000 LLIN nets into the networks we already have plus new networks that are opening up to us. In order to do this we need to raise an estimated $200,000. Will you commit to buying a net every month – 10 dollars a month could save up to 60 lives a year. Your tax deductible donation will help us to save up to 5 people’s lives.